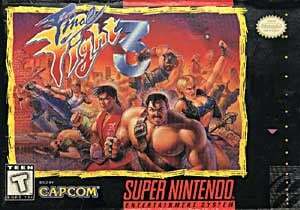 Following the enjoyable-but-flawed SNES conversion of the original Final Fight and its disappointing sequel, Final Fight 3 can be viewed as Capcom's attempt to atone for its previous sins and give fans a domestic exclusive worthy of the name. Released relatively late in the lifespan of Nintendo 16-bit's console, this third entry is a genuinely innovative title with fresh ideas and some engaging gameplay — but it's far from perfect and has seen its reputation grow over time thanks to the fact that it's incredibly rare in its original cartridge form. Final Fight 3 sees the return of Metro City mayor — and part-time street fighter — Mike Haggar, who, after defeating the evil Mad Gear gang, has decided to grow a ponytail. The introductory sequence sees him hook up with Guy from the first game, but their tender reunion is shattered by a sudden outbreak of rioting in the city, orchestrated by a new gang which has taken control of the streets thanks to the power vacuum created by Mad Gear's demise. 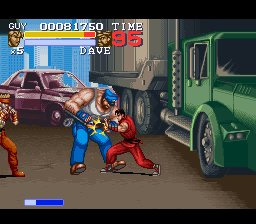 Quick as a shot, Guy and Haggar are joined by police officer Lucia and street punk Dean, and the quartet decide to deal with this threat in the only way they know how: with their fists. If this is how Mike Haggar deals with civil unrest then it's little wonder he gets voted in year after year, despite his questionable hair. While Final Fight 3 retains the side-scrolling pugilistic action that was present in its prequels, it fleshes out the number of moves each character has in order to make things a little more interesting. All four fighters are now capable of running attacks, and can also grapple from the rear as well. However, the most exciting addition is special moves, activated by Street Fighter II-style pad-and-button commands. During combat, a "Super" gauge fills up, and once this reaches its maximum level you can execute an incredibly potent attack which leaves your enemies bloodied and beaten. However, should you leave it too long before pulling off this move, your Super gauge empties and you have to wait for it to refill. 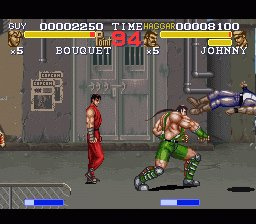 The four available fighters are all different enough to encourage you to play several times over in order to familiarise yourself with them all, and there's a two-player mode to further extend the longevity of the game. Furthermore, Capcom has included the option to allow the computer AI to control the second character, which means you can enjoy the multiplayer experience even when there's no one else to play with. Finally, branching pathways through each level add another layer of complexity, making this a game you can come back to many times over. Visually, Final Fight 3 doesn't look quite as amazing as you might assume. The character design has a cartoon-like feel to it — hardly surprising when you consider that Capcom was working on the similar-looking Street Fighter Alpha series at the time — and while this may appeal to some, it doesn't have quite the same coherence and charm as the original title. 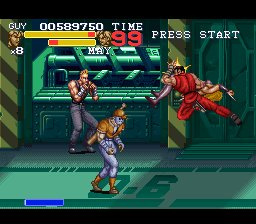 Like Final Fight 2, this sequel suffers from some dismal character design, not just in terms of enemy sprites but also in look of the main characters. Mike Haggar's aforementioned hairstyle is made all the more ridiculous by his skin-tight shorts and biker boot combo — a sure sign of a man going through a particularly bad mid-life crisis. It's a far cry from the sensible shoes and trousers he wore in the very first Final Fight, to say the least. Another issue is the horrendous slowdown which impacts the game whenever there are more than three enemies on-screen — this is especially bad when you're playing with a friend or AI partner. We'd like to say that it only stutters when there's a lot of action, but in reality the issue manifests itself with practically every move you make and is amplified whenever you interact with destructible elements of the scenery, such as glass windows or crates. Capcom can't be blamed for the slow CPU of the SNES, but one would have hoped that by 1995 its developers could have found a way of minimising the problem. The slowdown doesn't make it unplayable, but it does crop up enough to slightly sully your enjoyment. Final Fight 3 gets an awful lot right; the fleshed-out move-sets make the game feel like a true rival to Sega's almost peerless Streets of Rage 2, and the ability to play co-op with the AI livens things up no end. It's certainly one of the most robust and enjoyable side-scrolling brawlers on the SNES and has plenty of replay value thanks to the four main characters and branching paths. It's just a shame that Capcom has been held back by the limitations of the host hardware; slowdown is ever-present and unremitting, and you get the impression that it is only prevented from being even worse by the low number of on-screen enemies. Despite its niggles, Final Fight 3 manages to land more punches than it misses. It's certainly the best entry on the SNES, and should be your first choice if you're looking to sample Capcom's trio of side-scrolling scrappers — however, it's a long way off being Capcom's best side-scrolling fighter, no matter what the revisionists would have you believe. Loved this game, but the first is still the best IMO. Final Fight 3 is the only game in the trilogy I haven't yet played, and while I am curious to play it, I am rather hesitant about it (mostly due the fact that Final Fight 2 made me a little weary of the series, what with its plodding length and the fact that its gameplay was virtually identical to the first game's). I do wish to play it one day, I do, but the price tag is rather hefty (especially the Japanese version Final Fight Tough; I haven't touched the Virtual Console service in years). I do keep hearing that it's the better game of the trilogy and that's it more fresh and has got lots of replay value going for it. But so long as it doesn't threaten to give me arthritis or carpal tunnel like Final Fight 2 does (due the two-finger tactic I described in the comments section for that game's review; just to clarify, that's the only beat'em up I ever use that tactic for), I'm all for it! Until then, there's always the original Final Fight on Capcom Classics Collection Remixed or the Streets of Rage trilogy to tide me over (but mostly 2 and 3). This is the one of three I went for and I've really enjoyed the odd 15-20 min blast I between wind asker sessions. Its a great little side scroller. @Damo - this or Dungeons and Dragons? I predicted a 6/10, I'd still go with the original though. The sequels are not good at all.. This is an awesome game, have a CIB copy of it. All you beat 'em up fans out there should download this. Revisionism or not (I'm leaning towards not), this was the best game in the series when it came out and is the best game in the series now on a pure gameplay level. But I would be interested in the extensive list of console beat em ups that Capcom made that are supposedly better than this. Teenage Mutant Ninja Turtles IV - Turtles in Time (SNES). Dungeons & Dragons : Chronicles of Mystara (Wii U eshop / Steam). Viewtiful Joe 1 & 2 (Gamecube). (I originally had loads more than this but then I removed all the ones that I thought were junk). Capcom ports were generally pretty bad up until the Saturn. Then pretty good - Saturn / Dreamcast / Xbox and recently have become bad again. This is my favorite of the 3 on SNES. As good as the SNES version of the first one is it pales in comparison to the Sega CD version. I still have the cartridge for this game. @WanderFan91: You should check out Final Fight 3 even if you didnt like the second one. The branching paths add alot to the game. Its sounds weird but every time I play this game it feels fresh cause of all the different paths you can take. I gotta get this game! For My SuperNes!!! Final Fight 3 ain't bad, huge improvement over the 2nd game. Nothing beats the Arcade orignal Final Fight though. you boys will never learn will you? @MrHeli - I'm more into getting games in physical format myself, and I have contemplated coming back to the VC, I have... it's just that the connection wasn't working anymore for the Wii at the time and I had forgotten the access code to it. 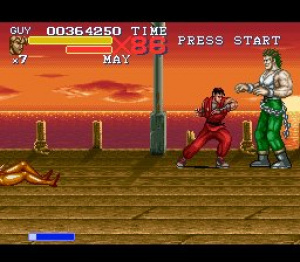 Second best Final Fight imo. It's much better than the second game! Why not make a new Final Fight as a Wiiu eshop title? I think the time is right for a new entry in the troubled series! @WanderFan91 I'm with you on that.. As the proud owner of a SNES with games like Demon's Quest & Yoshi's Island, a game boy micro famicom edition, original gameboy & a neo geo pocket color, I'm re-living the 90's again! Hope you got/get your wii back up and running.. I have about 100+ VC games I've downloaded over the years..but nothing beats the real thing! I have played Final Fight 1 and 2 on the Super NES during the 90's. I love the 90's!!!!! I haven't played the third yet. Good job on the overall score. Whenever possible, I'll be downloading that game at the eShop for the U. Love this game, going to buy it soon. Having the computer AI as a second player is great, but it usually only survives 2-3 levels and you are eventually playing on your own anyway.